"Sonic Colours" and "Sonic Colors" redirect here. For the DS version, see Sonic Colours (Nintendo DS). 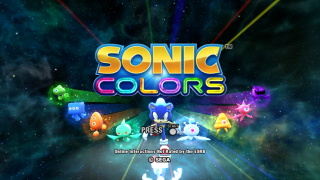 Sonic Colours, called Sonic Colors (ソニック カラーズ) in the USA and Japan, is a Sonic game released for the Wii in late 2010. In a similar manner to the Sonic the Hedgehog games' début in 1991, which saw both a Master System / Game Gear 8-bit release and a Mega Drive 16-bit release concurrently, Sonic Colours was released both as a Wii game and a DS game. Both games share the major plot element in that Sonic has to save an alien race from an intergalactic amusement park run by Eggman. However, they differ significantly as well, in terms of both gameplay and story. The Wii version gameplay expands upon the 3D/2D gameplay style introduced in Sonic Unleashed, while the DS gameplay is more like Sonic Rush and Sonic Rush Adventure, but trades the trick system for the moves introduced in Sonic Unleashed, such as the Slide, Stomp, Wall Jump, and Air Boost. Eggman claims to have developed a sense of remorse after his lack of judgement in the past and decides to build his next massive amusement park, Dr. Eggman's Amazing Interstellar Amusement Park, in space, using the power of small alien creatures known as Wisps to power the interplanetary monstrosity. While Sonic instantly suspects Eggman's evil intentions, Tails believes he has genuinely had a change of heart. Sonic, the only playable character, retains all of his abilities from the game's predecessor, Sonic Unleashed, although certain limitations have been set on the Quick Step and Speed Drift abilities. The Sonic Boost returns, however, the ring energy system has been removed, the gauge has been shortened slightly, and meter refills are now found in the form of White Wisp capsules, which will fill a portion of the gauge. Quick Stepping can now only be executed in special "Quick Step" sections that will display an icon indicating that tapping left or right on the control stick will initiate a Quick Step in that direction. Similarly, there are special "Drift Sections" in which an icon will appear indicating that the player can execute a Speed Drift by holding the button and leaning the control stick in that direction. Boosting is disabled in these sections. Level designs have been modified to fit these restrictions, and as such, these moves are no longer used as cooperatively. Sonic has also equipped with a Double Jump to prevent players from moving too fast while in midair and overshooting small platforms. While 2D gameplay still focuses on rolling hills, curved slopes, springs, and ramps, it also has a focus on rectangular structures and 90-degree angles that slow down gameplay slightly. Because of the increased focus on exploration, the levels tend to span more vertically than they do horizontally. Many of these stages also tend to play more like short puzzles. White Wisps, give Sonic the Sonic Boost, allowing for fast speed bursts which can damage enemies. Cyan Wisps, turn Sonic into a laser, which allows him to ricochet between walls and go through formations of diamond shaped prisms. Yellow Wisps, turn Sonic into a drill that can dig through certain surfaces, allowing access to other paths. Orange Wisps, turn Sonic into a rocket that can blast into the air to reach higher areas. In some 2D acts, a set of yellow springs will hover beneath Sonic while slowly moving forward. Executing a Stomp will cause Sonic to bounce higher off of these springs, allowing him to reach more elevated platforms. Because these springs move relatively slowly and are often located above pits, going too fast may cause Sonic to fall off. Many of the 2D sections in the game feature blocks and crates that Sonic can interact with. These blocks are also sometimes used as obstacles, platforms, and parts of the level layout that Sonic must navigate around. Breakable blocks appear to be made of some sort of dissolving metal material. Sonic can destroy them by stomping on them, but they will not reappear. Reviving blocks are yellow and will reappear moments after being destroyed. Sonic can get rid of them without the assistance of Wisps. Wisp blocks are dark with glowing lines around them. They can only be destroyed with the use of Color Powers. Red Rings and pipes are often hidden beneath them. Blue blocks can be turned into blue rings and vice versa by using the Blue Cube Color Power. Pushing blocks or crates can be pushed by pressing and holding while standing close to them. Sonic will charge up and initiate a kick that pushes them depending on how long it is charged. This also can be used to defeat lines of enemies. Solid blocks are dark with glowing blue edges. They cannot be broken and are usually used as part of the level design. Bomb blocks are black with red outlines. Touching a bomb block will set off a timer that will cause it to explode, destroying any other bomb blocks surrounding it. If the bomb block explodes while Sonic is touching it, he will be injured. Platform blocks are flattened blocks that Sonic can walk across or use to reach higher areas. They come in a variety of different designs and sizes to match each stage. Sometimes, triggering a switch will cause these blocks to move. Some platform blocks will fall if Sonic stands on them for too long. By collecting Red Rings in the normal stages, you unlock levels in Game Land. By earning enough rings, you can unlock 3 Acts in Game Land per real level. At the end of the 3rd Acts in Game Land, instead of a Goal Ring, there is a Chaos Emerald. By completing Game Land entirely, you can gather all 7 Chaos Emeralds and earn a mode to play as Super Sonic in the main game's levels, the first time for a 3D Sonic title. Sonic Adventure and Sonic 06 have data when hacked suggesting they were going to have Super Sonic playable in the main game as well, but they were never finished. Super Sonic can be used in all levels but not in boss battles, including the final boss. If you can read this you’re a geek! 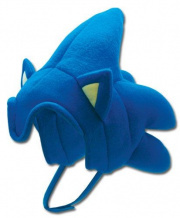 As a gift for pre-ordering the game at GameStop, Colors included a hat shaped like Sonic's head. A "Special Edition" of the game released in Europe, which came with a Sonic figurine as well as three wisp figurines (white, cyan and orange for the Wii version and yellow, red and blue for the DS version). The Special Edition was released in Spain, Italy, France and Germany. In France and Spain it was sold in Carrefour retail stores, naming the pack the "Carrefour Edition". Unlike Europe, Australia received the figurines and a blue Classic Controller. NOTE: The following data comprises of sales from both the Wii console version and the DS handheld version of the game. This game is notable for being the first widely played Sonic game to take place after the major North American cast change in 2010 (Sonic Free Riders was released slightly earlier, but its exclusivity to the new Xbox360 Kinect limited its dissemination). All of the 4Kids actors (besides Mike Pollock) have been replaced with a new cast from this game forward. The Japanese cast, as usual, remains largely the same since the first Sonic Adventure game. This page was last edited on 18 April 2019, at 22:36.